Music Player is best and mp3 player. Design and layout is very nice in this application you can easily edit this application Design with our documentation. 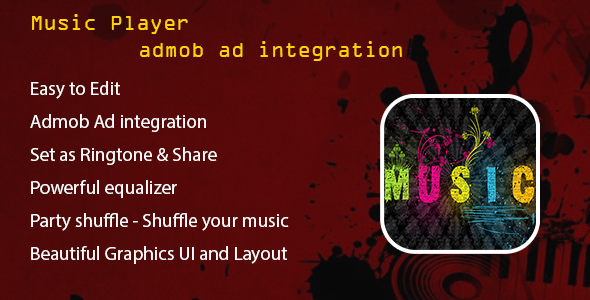 Music Player with powerful equalizer, Quick search all music files, custom background skin, free to get this perfect audio player and media player. Music player is not only based on artists or albums, but also based on the folder structure. Music Player will guide you find all the music files in seconds. The unique equalizer make your music sounds more professional. You are free to control the music style now. • Browse and play your music by albums, artists, songs, playlists, folders. • Easily set any song as your default Ringtone within seconds. • Song Details, Share songs and delete songs. • admob ad integration interstitial ad, banner ad id. This entry was posted in android, audio-video, mobile and tagged android, androidmusicplayer, androidplayer, app, backgroundplayer, mp3, music, music application, music effect, music player, music player application, songs by dadmin. Bookmark the permalink.